017 Nissan Sentra NISMO First Test: The Return Of The Hot Sentra? The last time Nissan offered a sporty Sentra was 2012, when the SE-R and SE-R Spec V models were powered by a 2.5-liter naturally aspirated I-4. Since the current Sentra entered production, a sporty variant had been absent—until now, with the Sentra NISMO. This time, the sporty Sentra comes with a loud exterior design with red stripes, wider lower air intakes, a different rear diffuser, side sills, a lower stance, and a rear lip spoiler. How does it compare to the sporty Sentras of the past? Let’s find out. With its upgraded chassis and steering, you’d expect the 2017 Nissan Sentra NISMO to handle well and be fun to drive when the road gets twisty. Up on the winding roads of Angeles Crest and Malibu, the car proved capable and entertaining to drive with minimal body roll; however, on the tighter bits, the car understeers a lot. The steering, on the other hand, isn’t communicative and lacks precision. Should you want better handling, Nissan offers Bridgestone Potenza RE-71R summer performance tires as an option, which should help mitigate understeer and allow the Sentra NISMO to stick to the road better. The torsion beam rear suspension doesn’t help the Sentra NISMO’s ride quality because it gets nervous and jittery over imperfections. Go over a large pothole or big bumps, and the rear end gets jumpy, especially if you do so while taking a corner. It does smooth out on better-maintained surfaces, but it’s still a little too stiff for what it is. 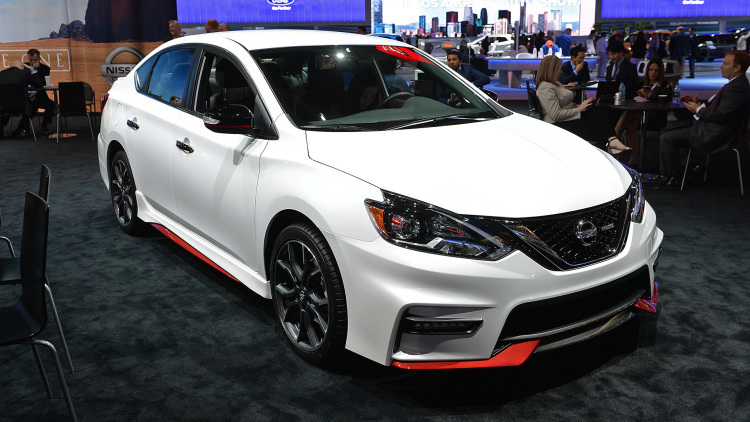 When you take into consideration that the Sentra NISMO’s driving dynamics fall short of other sporty compact cars, it becomes obvious that what you lose in ride comfort isn’t made up in superior handling. Featuring a 5.8-inch touchscreen, the NissanConnect multimedia interface found in the Sentra NISMO is outdated, and touchscreen responses are slow. Controls for the head unit are simple, using buttons, knobs, and the touchscreen itself. When compared to the cleaner 5.0-inch multi-information display between the gauges, the touchscreen’s grainy graphics make the car feel even more dated . As for the optional Bose audio system, it sounds decent but could be a little more balanced because it gets a little too bass-heavy at times. Our test vehicle with the six-speed manual checked in at $27,370, putting it in the same price range as the Civic hatchback, Jetta GLI, and Mazda3 2.5, but from the 2017 Nissan Sentra NISMO’s stiff ride and suspension to its lackluster handling and laggy powertrain, it feels incomplete. Additionally, the interior’s age is amplified by an infotainment system that’s well behind the units found in competitors such as the Civic and in more mainstream compacts such as the Chevrolet Cruze.